Therafin’s Hand Hole Superslide Transfer Boards offer a smooth transition from wheelchair to chair with the help of a hand hole. Available in 2 sizes. They are 3/8″ thick 7-ply birch, with woodgrain plastic laminate top layers. They offer a splinter-free surface with no lacquer to wear off and have been stress-tested to hold up to 400 lbs., and the board weighs 1.8 lbs. or 2.0 lbs. Therafin’s Hand Hole & Notches Superslide Transfer Board offers a smooth transition from wheelchair to chair with the help of a hand hole and notches for better stability. The board dimensions are 9″ x 24″. It is 3/8″ thick 7-ply birch, with woodgrain plastic laminate top layers. It offers a splinter-free surface with no lacquer to wear off and has been stress-tested to hold up to 400 lbs., and this board weighs 2.0 lbs. Therafin’s Large Hand Hole Superslide Transfer Boards offer a smooth transition from wheelchair to chair with the help of a larger hand hole. 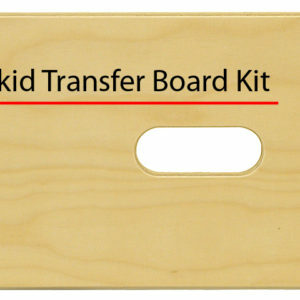 The board dimensions are 9″ x 24″. They are 3/8″ thick 7-ply birch, with woodgrain plastic laminate top layers. They offer a splinter-free surface with no lacquer to wear off and have been stress-tested to hold up to 400 lbs., and this board weighs 2.0 lbs. Therafin’s Large Hand Hole and Standard Hand Hole Superslide Transfer Boards offer a smooth transition from wheelchair to chair with the help of two hand holes of different sizes. The board dimensions are 9″ x 29″. They are 3/8″ thick 7-ply birch, with woodgrain plastic laminate top layers. They offer a splinter-free surface with no lacquer to wear off and have been stress-tested to hold up to 400 lbs., and this board weighs 2.4 lbs. They offer a splinter-free surface with no lacquer to wear off and have been stress-tested to hold up to 400 lbs., and this board weighs 2.4 lbs. The board has a Non-Skid Pad. They offer a splinter-free surface with no lacquer to wear off and have been stress-tested to hold up to 400 lbs., and this board weighs 2.0 lbs. The board has a Non-Skid Pad. Therafin’s Perpendicular Hand Hole & Up/Down Notches Superslide Transfer Board offers a smooth transition from wheelchair to chair with the help of a hand hole and up and down notches for stability. The board dimensions are 9″ x 29″. It is 3/8″ thick 7-ply birch, with woodgrain plastic laminate top layers. It offers a splinter-free surface with no lacquer to wear off and has been stress-tested to hold up to 400 lbs., and this board weighs 2.4 lbs. Therafin’s Perpendicular Hand Hole Superslide Transfer Boards offer a smooth transition from wheelchair to chair with the help of two perpendicular hand holes. Available in 2 sizes. They are 3/8″ thick 7-ply birch, with woodgrain plastic laminate top layers. They offer a splinter-free surface with no lacquer to wear off and have been stress-tested to hold up to 400 lbs., and the board weighs 2.0 lbs. or 2.4 lbs. Therafin’s Two Hand Hole Superslide Transfer Boards offer a smooth transition from wheelchair to chair with the help of two hand hole. They offer a splinter-free surface with no lacquer to wear off and have been stress-tested to hold up to 400 lbs., and the board weighs 2.2 lbs. or 2.4 lbs. Therafin’s Two Hand Hole & Notches Superslide Transfer Boards offer a smooth transition from wheelchair to chair with the help of two hand holes and notches for better stability. They offer a splinter-free surface with no lacquer to wear off and have been stress-tested to hold up to 400 lbs., and thes board weighs 2.2 lbs. or 2.4 lbs. Therafin’s Two Large Hand Hole Superslide Transfer Boards offer a smooth transition from wheelchair to chair with the help of two larger hand holes. They offer a splinter-free surface with no lacquer to wear off. They have been stress-tested to hold up to 400 lbs., and the board weighs 2.2 lbs. or 2.4 lbs.